Steven F. Havill is an American author who has written 2 mystery series and several western standalone novels. Reading the Steven Havill books in order includes his popular series is the Posadas County Mystery, set in New Mexico. It currently has 19 books, with the latest novel, Easy Errors, published in 2017. One might argue that there are two separate mystery series written by the author, with the first series called Bill Gastner Mysteries being separate from the Posadas County series. The reason is that after Bill Gastner retired from his job as a sheriff, Estella Reyes-Guzman, the new Undersheriff took over the job. I will list them separately as well, because the later book are really not about the retired Bill anymore. Steven F. Havill (website) was born in 1945 in New York and currently lives with his wife in Raton, New Mexico. The author was also a teacher, and through his work, he studied medicine for over 30 years, knowledge which he transferred in many of his books. The first Steven F. Havill book, Heartshot, which is also the first in the Bill Gastner series, was published in 1991. The story is set in Ruidoso, New Mexico, in southwestern New Mexico. Posados country is an imaginary border country. When the series started with the first book, Bill Gastner was already fast approaching retirement, as he was 60 at the time. That’s why the original series is relatively short, with only nine main books, which is then followed by the Posadas Country series that goes on even until today. 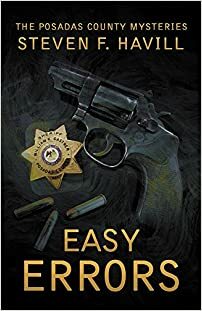 Early Errors, the author’s latest novel in his Posadas County Mystery series, published in 2017, is a prequel of the series which takes us back to 1986 when Bill Gastner was an undersheriff. The story focuses mostly on Deputy Robert Torrez’s first big case from back then. The book is, in fact, a prequel to the prequel, One Perfect Shot (which is Bill Gastner novella #0.5). The Steven Havill books in order are listed based on their publication date, with the chronological order in brackets next to the release date. One Perfect Shot was written in 2012, however, it is the prequel to the Bill Gastner Mystery series. It is the book that introduces Estelle Reyes, so for newcomers to the series, this is the perfect book to sink your teeth into, before starting with Heartshot. Historical mystery series set in a logging town in coastal Washington State in 1891 about a young man, Dr.Parks, who, after finishing medical school in Pennsylvania, goes to Port McKinney to join his dad’s friend’s medical practice, in order to practice trauma medicine. Hot pepper is spelled CHILE. Not chili. I hope there will be more Gastner books! I want to see what develops with his new career!!! I have the last two Steven Havill books left to read. I have enjoyed them all although I will miss Bill Gastner.